news A single individual Australian appears to have taken advantage of Telstra’s ‘free mobile data’ day on Sunday to download a total of 421GB on the telco’s mobile network, in a move that may prove costly for the big telco if it was replicated around Australia. Yesterday (Sunday), Telstra offered free mobile data to its customers nationally for 24 hours, in an attempt to make recompense for an outage in its national mobile network last week that knocked voice and data services offline for a protracted period. In a blog post on the telco’s Exchange site today, Telstra group managing director of Networks, Mike Wright, noted that Telstra’s mobile network had its “busiest day ever yesterday” due to the free data allowance. Wright said that by midnight on Sunday night, Telstra customers had downloaded about 1,841 terabytes of data — the equivalent of about 2.3 million mobies, 5.1 million episodes of a TV show like Game of Thrones, 23 million downloads of a new music album, or about 1.4 billion downloads of an electronic book. “We hope it helps make up for some of the inconvenience we caused,” said Wright. However, not all Telstra customers proved equal when it came to the downloads which they used yesterday. 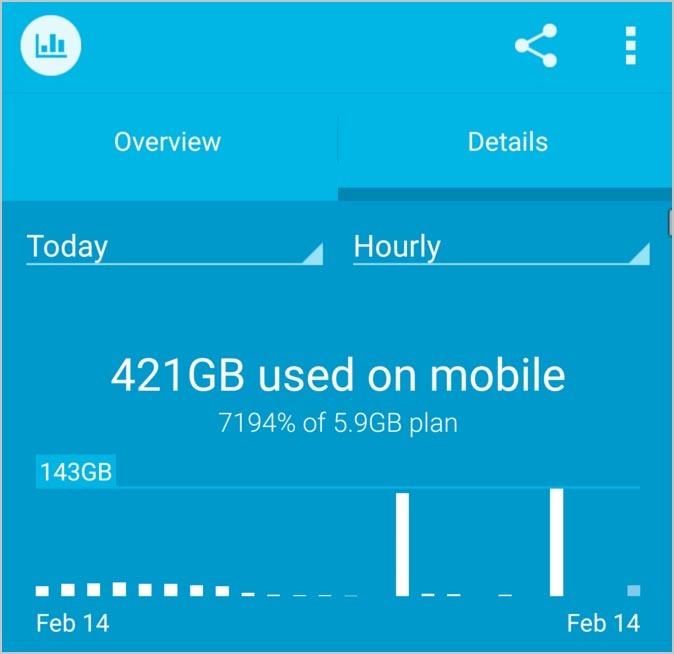 Redditor ‘DrRodneyMckay’ posted a screenshot of his LG G4 Android mobile phone, which stated that yesterday he had downloaded a sum total of 421GB on the free data day. The speed at which the user downloaded the data ranged from about 130Mbps to about 168Mbps — significantly faster than the speeds available over most fixed broadband connections. On Reddit, the Telstra customer stated that they downloaded all 25 seasons of the ‘How It’s Made’ documentary series, as well as a a “few other random TV show seasons” and their whole video game library on the Steam platform. Normally the fastest the user is able to achieve is 1.5Mbps over their home ADSL connection. Holy cow … that is a huge amount of data. I can’t help but think that Telstra must have taken a substantial financial hit from this episode, both due to the sheer cost of servicing Australians (notorious downloaders of overseas content) yesterday, but also through the many problems resulting from its outage earlier in the week. The cost of servicing ‘DrRodneyMckay’ alone yesterday would have far exceeded the value Telstra would get from the user’s mobile contract, in my estimation. I suspect that ‘DrRodneyMckay’ is right: It looks like Telstra has at least partially used this opportunity to undertake a giant stress test of its network, in order to identify bottlenecks and other issues. 421GB in a day over a mobile network and a single mobile phone … that is a lot. How far we have come in Australia over the past decade in terms of mobile connectivity. It wasn’t too long ago that this kind of mobile performance would have been viewed as just impossible. hahaha telstra should get this everyday because its the most greedy isp i have ever seen !!!!!!!!!!!!!!!!!!!!!!!!! Do we have any kind of estimates as to how much it costs Telstra or Optus etc. to provide a few GB of mobile data to each customer per month? I’m curious as to whether there really is any genuine justification for giving us such pitifully small data caps when we now have 4G speeds measured in 10s if not 100s of megabits. This exercise at least proves that providing that amount of data is possible, if not cost effective. I also understand the need to reduce congestion, but should we not at least be TRYING to move into double digit mobile data plans by now? Genuine justification…. It makes them more money on their monopoly network? It appears that congestion wasn’t a real big deal. It would have been in some areas. I recall when vodafone had their free data weekends on prepaid caps, the whirlpool thread would have people saying how great it is and one guy from Hervey Bay constantly complaining about being congested, and writing letters to vodafone etc to stop the free data. When in reality it should have simply highlighted the need for more service in that one location not the stopping of the promo for everyone else. Shame I couldn’t have used it, 3G and 4G in the town I live in here in Western Australia is abysmal at best. 3G fairs in at a couple of Mbps, and 4G comes in at slightly less. My old ADSL1 from about 10yrs ago was way faster than 3G and 4G speeds are here. Went into the nearest city to me and the speeds were 10 times better and sometimes just as worse. Note that none of these tests I did were yesterday, they were all about 2-3weeks ago. 1.841 TB total? Seems a bit low. typo perhaps? Sunday I could barely get data on 3G. Today 4G runs smooth as butter. Funny that. I use Telstra mobile as I’m stuck in a black spot and can’t get any wired services. Thanks service technician who screwed up. Thanks so much. Wanker. Why would it be costly? They already have the infrastructure and ongoing costs are fixed accordingly, whether nobody uses the network that day or it’s Sunday apology day. They would certainly attract a lot more customers. Telcos have to pay for outbound data that goes through international links but they have peering agreements. For most local connections within Australia they don’t pay much at all after initial infrastructure costs. TLS has heaps of spare bandwidth on the weekends but not that much on the weekdays. It’s entirely unclear to me whether Telstra is treated as a “telco” outside of the Australian or perhaps APAC market. They are a tiny fish in a large pond. It wouldn’t surprise me if they pay at 95-percentile billing at their egress points in places like the US and EU. Even so they are smart. A single day doesn’t impact 95% billing and they did it on a non work day so they didn’t disenfranchise their premo business customers. So for the wrong reasons you are right. This likely cost Telstra no more than one day of mobile data revenue, ie much less than 0.3% of annual revenue. ISP’s don’t pay per GB? So it wouldn’t have cost Telstra anything whatsoever. They establish peering between ISP’s and in situations where they have to buy bandwidth they buy fixed pipes (per megabit per month). The only thing it would have done to Telstra is slow or congest their network, not cost money. Telstra would have a hefty international bandwidth bill, to say the least — this would certainly have cost the company money. Unless they provisioned more international bandwidth for the day (unlikely), then it wouldn’t have cost them any extra. Like others have said, ISPs pay for bandwidth, not data. Really? Have you tried this lately? Telstra have likely 100s of physical inter-connect links around the planet with other providers. Most of them are probably 10G ports or some sort of aggregate interface with multiple 10G ports. One does not simply turn a switch to make all of these ports or LAGs suddenly have more capacity. You usually have to work with the corresponding party who may or may not have spare capacity. They may or may not require contract changes and they may or may not require additional physical interconnects to be run and tested. And, if you interconnect in a public facility you’ll have to order cross-connects. That all assumes your edge routers have spare ports and back-plane bandwidth to deal with a sudden augment. Point being, smaller players can augment virtual capacity at the flick of a switch, but for larger players, serious augments are physical. Not something one does in a day or a week or even a month in most places. Yes, I was agreeing with you, hence my sarcastic ‘unlikely’. Telstra still win! In some countries there is no such thing as mobile data limit. Plenty of us here in Canberra were left with unusable phones on Sunday from the free data bonanza. I had no problems in Canberra streaming a movie off Netflix for the kids on 4G. No buffering, was just like watching a DVD. Thanks Telstra, kept them quiet for an hour! If only you could make every Sunday quota free! I don’t think it would have cost them much, if anything. They own or lease fixed capacity circuits, plus they did it on an off peak day. Even if there was some cost to them, I suspect they were more than happy to pay it. They’ve essentially had a free, real world, stress test of their network. Don’t believe they turned off the billing for a day and went home for the weekend. Their engineers will be analysing how the network coped with the load, etc. It’s not the kind of testing you ordinarily get to do or can meaningfully simulate. Wouldn’t have cost them anything…. which is why they offered it in the first place. Very cheap publicity stunt for Telstra, well done. I was expecting the whole 3G/4G Telstra mobile data network to basically be unusable on Sunday but I was pleasantly surprised, I was able to tether my iPad to create a hotspot for my computer and it was totally usable. It did fluctuate a bit and it wasn’t quite as fast as my 4G normally is but was still significantly faster than my ADSL. Telstra seem to have lots of spare 4G capacity! Go for it I say if they offer such a product then they should deal with heavy users. Won’t DrRodneyMackay end up being charged for the data since they broke TOS by tethering or hot spotting their mobile? Surely you can’t download that much on a mobile phone and keep swapping SD cards in a day. You can tether on Telstra since … um.. well I can’t remember a time I couldn’t. My speed was dramatically reduced for 16 of the 24 hours from 600kB/s to 30Kb/s. In those 24 hours I was able to download ~20 gigabytes. Whilst I am glad people were able to take full benefit, I was not, and so my view of Telstra only degrades. Bring on the FW NBN, I am sick of these criminals. so much for free data day. I made a few calls and paid for all of them. They bled me dry as usual. Explain that Telstra. You do realise that data and voice calls are not the same thing right? Telstra only turn off the data measuring system on the free data day.